Our Mission is integrating traditional Chinese acupuncture with anatomy, orthopedics, and western sports medicine practices. When I wrote The Acupuncture Handbook of Sports Injuries and Pain, my goal was to present the practitioner with diagnosis and assessment that combined both TCM and orthpedic perspectives. And the treatment plans would be flexible and offer both traditional TCM protocols as well as anatomically significant points at the site of injury. We have received great feedback from the profession. And we encourage you to give us feedback which may assist in future editions of The Acupuncture Handbook. Section I presents a unique four-step approach, which includes 10 techniques of acupuncture. You will not read about this protocol in any books, as it is developed by Whitfield Reaves and his 30 years of clinical experience in Acupuncture Sports Medicine. It offers a systematic and logical progression of techniques, from distal to the site of the injury. And it includes all the techniques that acupuncturists know and use in everyday practice. Section II covers the diagnosis and assessment of each of the 25 injuries, with a very clinical summary of the injury. After this western overview, each injury includes acupuncture treatment and techniques using the four-step approach. Upper extremity injuries include the supraspinatous, infraspinatous, and biceps muscles of the shoulder girdle. Medial and lateral epicondylitis and carpal tunnel syndrome are also covered. Lower extremity injuries include ilio-tibial band syndrome, patello-femoral joint syndrome, shin splints, achilles tendonitis, and plantar fasciitis. Section III contains the Appendices, with commentary on the techniques and protocols from the first two sections. Included is commentary on the tendino-muscle meridians, commonly used extra-ordinary points, and a summary of orthopedic assessment and testing. This review is edited from a longer and more extensive piece that appears in this Journal. 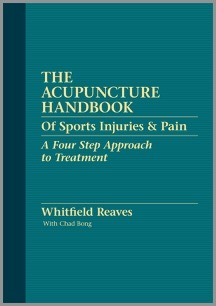 "This book presents a four‑step approach to the treatment of sports injuries and pain with acupuncture. The aim is to present a ‘treatment flow‑chart’ that covers all the main approaches to musculoskeletal conditions and that encourages the practitioner to think in a logical and systematic manner. On the whole, this aim is achieved admirably. It does not discriminate, but integrates a whole host of techniques from auricular acupuncture and cupping to trigger points and electroacupuncture; thus it delivers a rich and comprehensive overview of useful approaches. "Considering the high volume of musculoskeletal conditions seen at an average acupuncture clinic, there are relatively few books that tackle the subject in detail. There is certainly a feeling that all the conditions included are very familiar to the author and that the techniques he presents have been thoroughly tried and tested. Reaves has done an excellent job of including as many approaches as possible. Overall, the author strikes a happy balance between clinically useful detail and inclusiveness. "The Acupuncture Handbook is essential reading for anyone who treats sports injuries."